Supply Chain Partner Visibility: Are We There Yet? | ACSIS, Inc.
Supply Chain Partner Visibility: Are We There Yet? 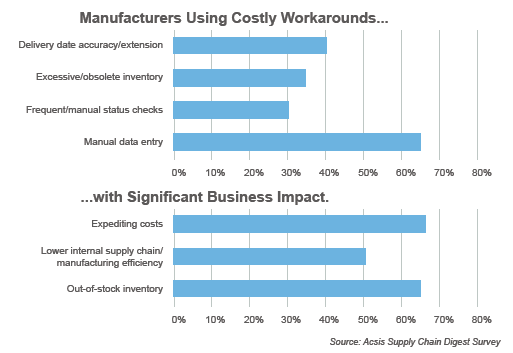 According to an ACSIS survey done in partnership with Supply Chain Digest, most manufacturers are not even close. At SAP in the 90s, we led the led the charge to “integrate” for enterprise visibility. But today, the enterprise has become more complex and interconnected with third-party partners, and it is no longer enough to have one execution system handling operations outside the four walls. That’s why there’s a new breed of solutions that fill the gaps in SAP (and other ERP systems) to make ERP more effective (and the business run better). That’s our focus at ACSIS and why I am excited to share the results of our recent integration survey. In May and June, we surveyed 110 supply chain executives in chemical, food & beverage, consumer products, pharmaceutical, and other manufacturing sectors to uncover the priorities, expectations and challenges of third-party integration. View the results analysis in an infographic here. The primary reasons that partners are “disconnected” from systems include complexity, security and integration costs. But the workaround costs may be even higher: from padding customer delivery dates (41% of respondents), to holding excess inventory (35%), to redundant manual data entry (64%). And the consequences include paying expediting costs as a result of “crisis mode,” (67%) and jeopardizing customer retention and satisfaction with stockouts (64%). Oh, and we also found out that 32% of manufacturers still rely on fax to communicate production status with partners. Forty-two percent of survey respondents report they are increasing their level of outsourcing and 26% report that they have already largely outsourced activities to outside suppliers. Yet, most are dissatisfied with the quality of information they receive from the partners in their supply chain networks, citing concerns about accuracy, timeliness and detail. Perhaps that’s because their communication methods are 20 years behind. And we’re not just talking about the 32% using fax. Eighty percent rely on email as their means of information reporting with supply chain partners – largely through spreadsheets. For many, the outdated partner communication methods may come as a surprise. But at ACSIS, we understand the reality and the pains of supply partner integration and collaboration. That’s why ACSIS Edge Network was designed to allow partners to exchange data using technology they already have – from a web portal to automated data capture systems – eliminating the need for special training and allowing partner systems to communicate directly with ERP. Interested in hearing more about this approach, the implications of the survey results and DuPont’s supplier integration success story? If so, check out this free, on-demand Supply Chain Digest webinar, available here.